Historically, it has been common to write of disease and illness as something monstrous or as an invading force. This characterization can be seen in early modern discussions of gout, in Victorian ideas of epidemic diseases, such as cholera, and in twentieth century understandings of cancer. Here, Charlotte uses some famous fictional monsters to describe kidney disease. The room was filled with beds, each inhabited by a very sick looking person who was hooked up to a large, ugly machine. There was a constant low level hum and my strongest visual memory is of blood. Blood being pumped through tubes, out of arms, into machines and back again. And then I saw something which filled my very soul with horror. There lay the Count, but looking as if his youth had been half restored. For the white hair and moustache were changed to dark iron-grey. The cheeks were fuller, and the white skin seemed ruby-red underneath. The mouth was redder than ever, for on the lips were gouts of fresh blood, which trickled from the corners of the mouth and ran down over the chin and neck. Even the deep, burning eyes seemed set amongst swollen flesh, for the lids and pouches underneath were bloated. It seemed as if the whole awful creature were simply gorged with blood. sad yellow faces, out of which stared dull, lifeless eyes. His yellow skin scarcely covered the work of muscles and arteries beneath; his hair was of a lustrous black, and flowing; his teeth of pearly whiteness; but these luxuriances only formed a more horrid contrast with his watery eyes, that seemed almost of the same colour as the dun-white sockets in which they were set. What is clear from Charlotte’s account is that she does not think of the kidney patients as monsters. Rather, she identifies their illness as something monstrous which has attacked them, just like the monsters of these tales of terror. Susan Sontag has argued that illness was often talked about through metaphor: that disease was discussed as something else, rather than dealt with head on. She claims that this led only to the avoidance of truthful discussions about disease and its effects – that disease becomes a metaphor for something else. 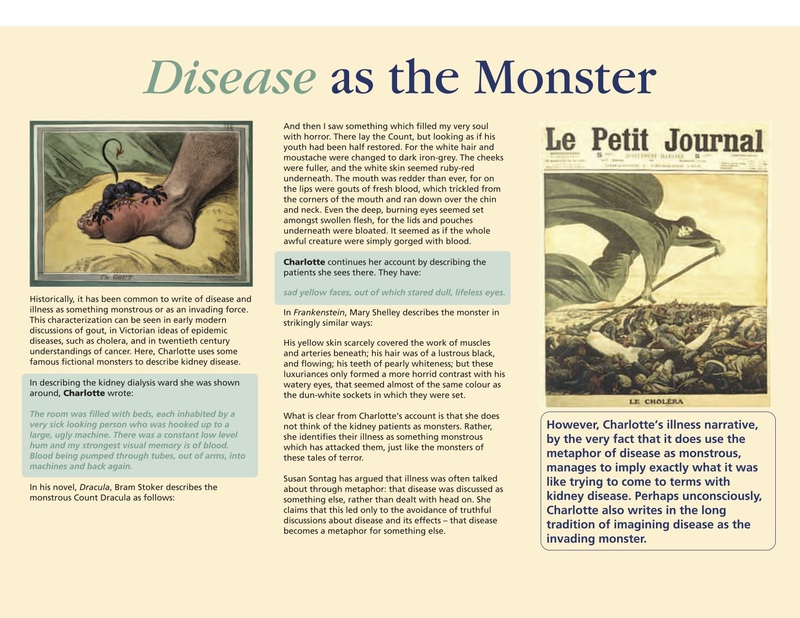 However, Charlotte’s illness narrative, by the very fact that it does use the metaphor of disease as monstrous, manages to imply exactly what it was like trying to come to terms with kidney disease. Perhaps unconsciously, Charlotte also writes in the long tradition of imagining disease as the invading monster.